Monitor and Control Project Work not only involves identifying variances on the PMP Certification Exam, but also determining whether the variance is acceptable, what caused the variance, and what (if anything) you should do about it. This is where expert judgment is useful. Expertise is used to analyze performance, pinpoint the cause of variances, and determine the appropriate actions to address performance variances. You can use a number of techniques to analyze past and current performance and also forecast future performance. This state could mean that you’re accomplishing work faster than expected, so you’re spending funds faster than expected. This is fine if you’re actually spending the same amount you budgeted for the work; you’re just doing it earlier than you planned. This could also mean that you’re spending money to expedite work. In other words, you’re crashing your schedule to finish quicker. This might be okay, depending on the priorities for the project. If you’re trying to get to market as soon as possible and the sponsor or client is willing to spend more to get there faster, you’re in good shape. This isn’t good. You might have underestimated, or maybe you’re not doing a good job managing the project. This could also mean that a risk event occurred, and you had to spend money and take time to respond to the situation. This might be the most suspicious of all situations. It rarely happens, so the results should be scrutinized to see whether the cost and schedule estimates were padded, or perhaps you have an error in the numbers. Most likely, your project is starved for resources. You’re under budget because your labor costs are lower than expected, but you’re behind schedule because you don’t have the manpower to accomplish the work as planned. 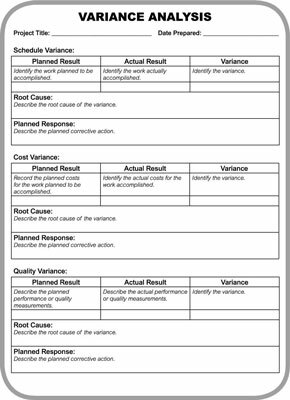 From these examples, you can see that you’re looking at combined information to understand the cause of any variances and understand the implications of the variances. Another source of information you should review is the status of your cost and schedule reserves. If your project is 30 percent complete but you’ve spent 60 percent of your reserves, you should understand the implications for your project. Perhaps the first 30 percent was the riskiest, and the remaining 70 percent is relatively risk free. In this circumstance, your remaining reserve should be sufficient. However, if the majority of the uncertainty in your project is likely to be toward the end, then it’s a fair assumption that you will overrun your budget. Good performance reports include cost and schedule forecasts along with the supporting data to explain the forecasts. Forecast. An estimate or prediction of conditions and events in the project’s future based on information and knowledge available at the time of the forecast. The information is based on the project’s past performance and expected future performance, and includes information that could impact the project in the future, such as estimates at completion and estimate to complete. A time series forecasting method uses a model to predict performance based on past performance. In general, time series forecasting is more accurate for a short-term forecast for which future events are expected to be similar to the recent past. Predictions get less accurate the further in the future they fall. Another consideration with time series forecasting is whether the work or the environment for the future work is different from the past work. If so, time series forecasting is not the best method. You might consider trend analysis instead. 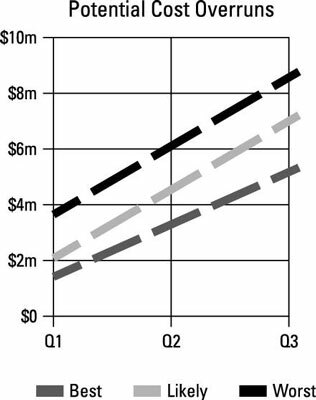 Trend analysis entails plotting the progress for past reporting periods and then projecting future performance assuming the same trend continues. Regression analysis looks at the relationship among variables that cause fluctuations in outcomes. You assume the budget is the dependent variable and then that resource skills, availability, and cost are independent variables. You are looking to see the expectation of achieving the budget based on changes in each independent variable. With this method, a person (or group) estimates cost or schedule performance; this estimate is based on knowledge and expert opinion. Experts may develop probability estimates or build models based on various scenarios. Sometimes this method seems as if it’s based on intuition or an educated guess. However, many times, you can’t really quantify the knowledge that experience brings. A bottom-up estimate by an expert can oftentimes be the most accurate method of forecasting. Other forecasting methods include running simulations and probabilistic forecasts (a forecast based on a probability distribution). In reality, using multiple methods will end up with the best results. The PMBOK Guide mentions many analytical techniques, including fault tree analysis, failure mode effect analysis (FMEA), and grouping methods. Don’t worry! You don’t have to know and understand all those methods of forecasting. You should just understand the basic ideas that you can use the past performance, variables that drive the future, or expert judgment to develop a forecast. One way of documenting variances is by using a simple variance analysis form.